Ordering was a little cumbersome since the giant TV I'm assuming is supposed to serve as a menu board was out of commission. We perused the paper menu when we got up front and settled on 5 different tacos. I had to head to the bar to order a beer though... must be some kind of liquor law thing? Starter was chips and salsa (which I was a little worried would show up at the same time as all our other stuff) but surprised me and arrived at the table early. Chips had a nice spice and the salsa was good. 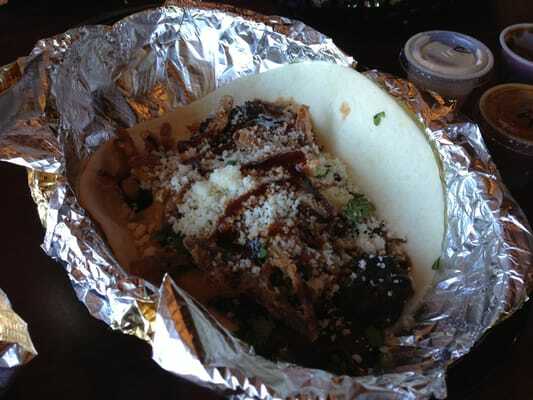 The tacos we ordered were Smoked Brisket, Baja Shrimp, Barbacoa Beef, Short Rib, and Alligator. Beyond the Alligator and the Shrimp, we had trouble distinguishing which taco was which. (An issue we had in common with the employee who delivered the tacos). I didn't read the full descriptions when I ordered and was pretty surprised to see the Alligator and Shrimp tacos. Especially the shrimp... With a name like 'Baja' I'd expected fresh lime, pico, avocado, etc. What we got was popcorn shrimp with a lettuce/cheese explosion. The Alligator was dressed similarly. Those two tacos were essentially unpalatable. The beefy offerings fared better, with decent flavor and toppings. The leader of the pack for me was the Smoked Brisket, with re-fried beans and jalapeños. And if anyone from Voodoo is reading this that can do something about it... Please pay some attention to the shells. We lucked out and didn't dare order corn, but were less than excited by the cold flour tortillas. 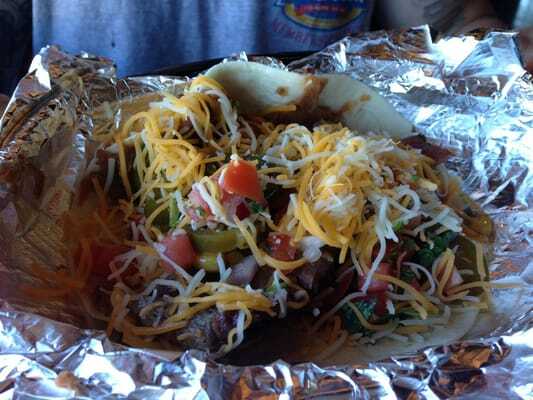 I feel that the taco shell shouldn't just be a vehicle to get fillings in your mouth,and that the tortilla should have a little something as well. Namely heat, at a minimum. For a total of nearly $30, I would've hoped for better. (Especially since yesterday we spent $13 at a food truck and had a 5-star quality tacos and tortas). 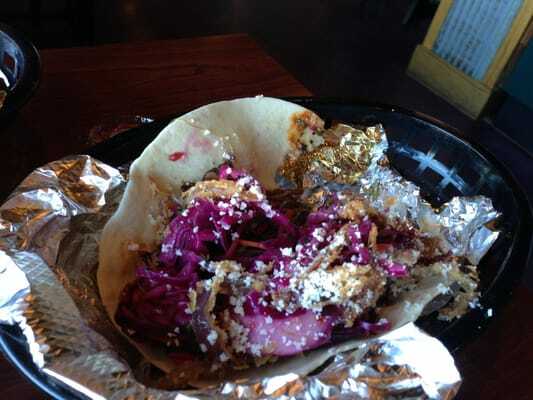 It's an interesting concept, but for me Voodoo Taco just doesn't compete with the real thing.